Notes: The Hot Wire Caddis was designed by Ken Morrish of Ashland, Oregon. Ken owns and operates a fly fishing destination business in Ashland, Fly Water Travel. His background with this pattern comes from guiding around Northern California and the Sierra in the 1980's and 90's. It's his variation of a Copper John in which he wanted to adapt the pattern to caddis rather than the stonefly or mayfly profiles that the Copper John tends to imitate. Ken eliminated the tail biots and utilized a curved hook, TMC 2457 or a comparaible Daiichi 1120. A couple strands of black floss is attached to the top of the shank as a shellback with the wire providing segmentation. Ultra Wire by Wapsi has come up with a number for very caddis compatible colors which Ken wished to take advantage of. 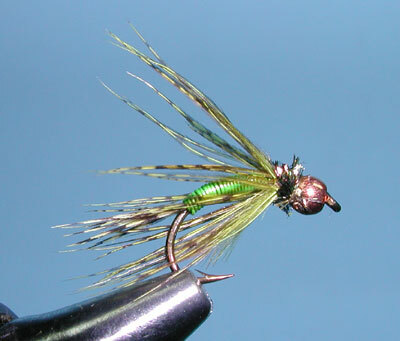 Ken is a "Signature Tier" for Idylwilde Fly Company and was greatly influenced by the late Andre Puyans. The Hot Wire Caddis flies are marketed by Idylwilde and sold throughout the Sierras using four color combinations of Amber Wire/Brown Biot, Chartreuse Wire/Gray Biot, Olive Wire/Black Biot, and Tan Wire/Tan Biot. The late Bill Carnazzo, Sierra Fishing Guide, wrote about his Partridge Hot Wire Soft Hackle in the Nov/Dec '09 issue of California Fly Fisher magazine. 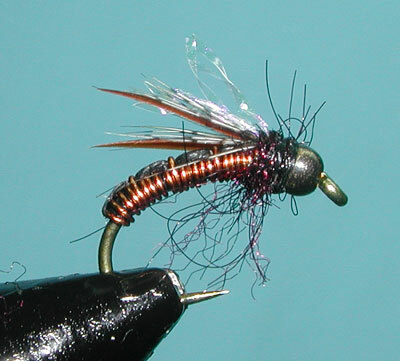 This is a cariation of the Hot Wire Caddis utilizing an Olive Partridge feather for a soft hackle and a Peacock collar. 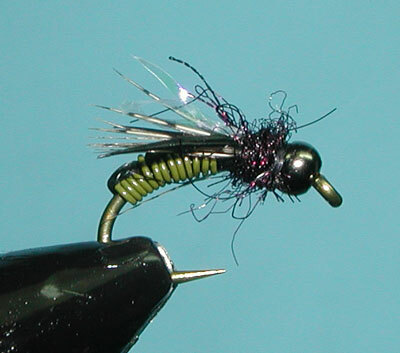 Bill used this pattern for short-line nymphing.